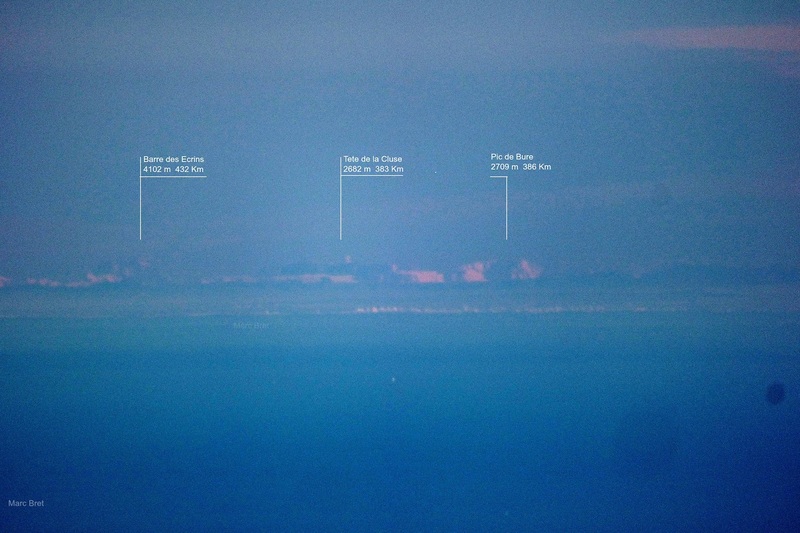 Photograph achieved in a day of great transparency, from the Bastiments with little focal length to frame some silhouettes of the Alps and Ventoux behind of the Gulf of Lion, in complete daylight. Getting to see the Alps from the Pyrenees seemed an extremely difficult goal a few years ago. No photos existed, or at least were not published. Achieving it in complete daylight without the help of the alignment of the sun or the dawn screen effect still seemed more difficult. Alps sectors with more zoom, and a little over contrasted, to ease the view of the details. One album with other pics of that day can be found here. The panoramic simulation of Ulrich is available here. The Doigt de Dieu was the most distant summit and the World Record for distant pictures until July of the same year. Currently World Record is from another summit of the Pyriness although in this case with a contemplation before the sunrise. 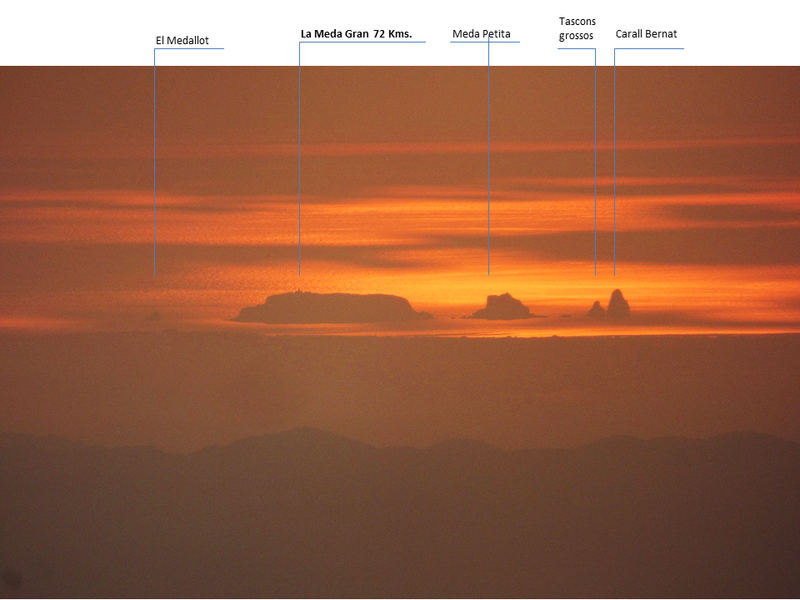 Turó de l’Home – Illes Medes | 72 km. Ses Illes Medes, are a small archipelago of the Costa Brava (Catalonia-Spain) and a protected reserve of marine fauna. From the highest point of the Massís del Montseny (1706 m) the distance is not very long, only about 72 Kms, but often poor visibility does not allow them to be seen. On this occasion however, there was a great ally: The reflection of the sun in those just moments influenced the waters around them and the occasion could not be let out. Marseille – Canigó | 263 km. 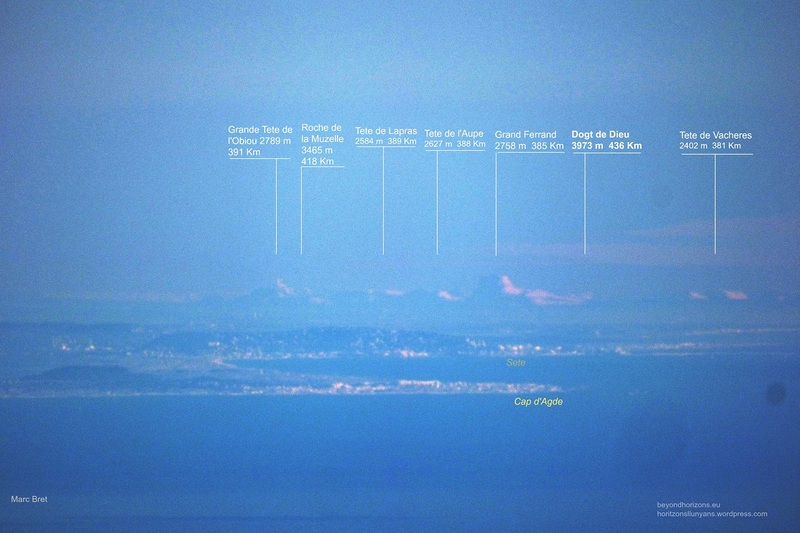 The Peak of the Canigó (2.785 m) portrayed by Alaign Origné from the peripheric zone of Marseille (France) at 263 Km. View of the city in the foreground. Abbaye of the Major is on the left. For the second picture please look the complete post! For more by J.Pierre Petit here. 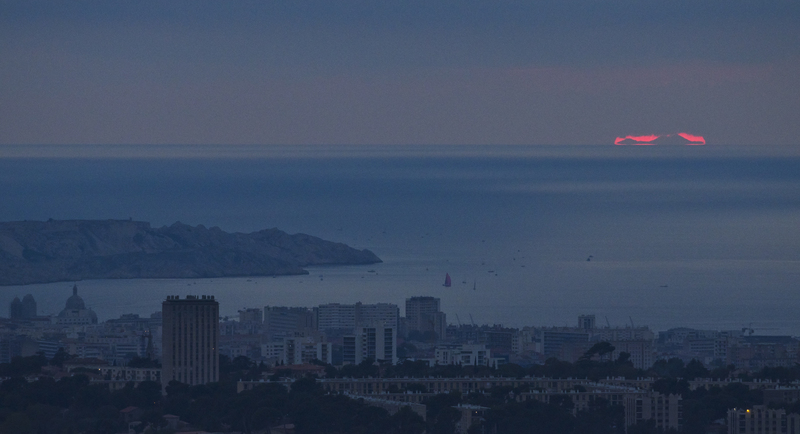 The prominent Canigó, photographed from Allauch, a strategic location (to make photos) next to Marseille, at 320 meters high. To illustrate this singular view we have chosen two images of Alain Origné, an expert photographer specialist in this type of portrays. The distant silhouette of that mountain from this part of France it’s only perceptible thanks to the influence of atmospheric refraction, as the trajectory of rectilinear vision passes beneath the line of the sea. Actually many people already call “Canigó effect” to the fact when it’s only possible to see a silhouette thanks to atmospheric refraction. By the other hand, the conjunction with the sun. Obviously it was not coincidence. In concret, from Marseille the succes occur around 8 February and 1 November. Some photographers from distant horizons as Alaign Origné take advantage of the dates to achieve the best images. Barre des Écrins (4.102 m) is in the middle left of the image. Taken from Pic de Finestrelles (2.820 m) at 440 Km, before sunrise. In the rest of the pictures, another summits can be seen further away. Portraying the silhouette of the Barre des Ecrins from the most distant possible summit of the Pyrenees and get a new World Distance Record has been for us the last most recent target. The result is counted in the image: a view from Pic de Finestrelles (2.820 m.) to the Alps. Want to try yourself? Don’t forget to check our reccommended cameras! Puy de la Seche – Pic de l’Infern | 403 km. The farthest sunset ever captured! 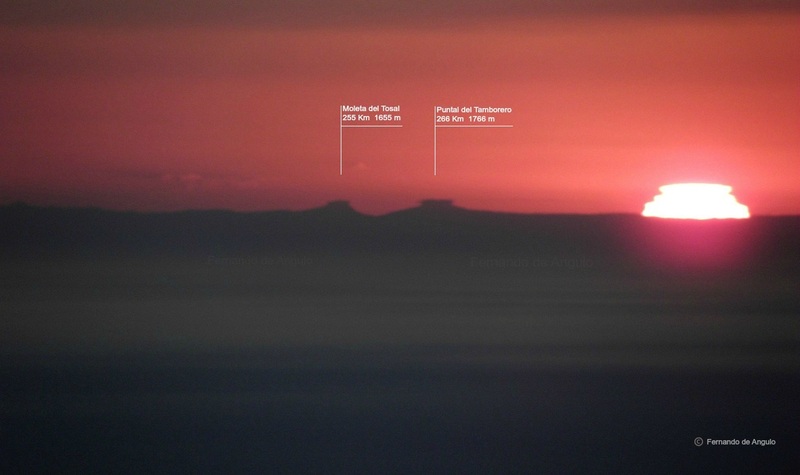 The silhouette of the Canigó massif and Pic de Prats de Bacivers (Pyreness) in front of the sun with a superior mirage effect . It’s probably currently the farthest sharp photo (*1) of a horizon made from another land point and and possibly also the most distant setting sun photographed. In this regard it’s a new world record. The profile of the Serra de Tramuntana in the north of Mallorca is visible from Barcelona several times throughout each year but few people realize. 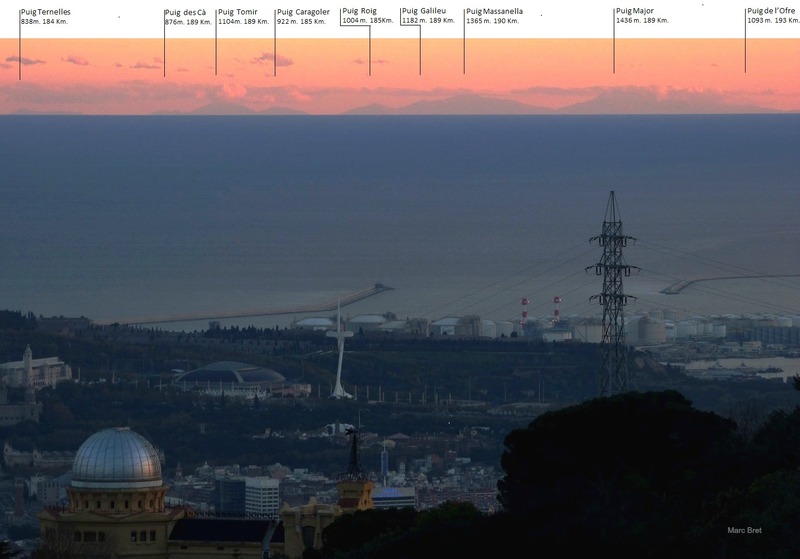 The best place to achieve a beautiful view is from the Tibidabo mountain, the highest hill in the city. Great transparency days make Mallorca very easily to be seen with the naked eye and occupies a wide extension of the horizon. The best moments usually be at dawn, especially in autumn and winter. However, this image was possible at sunset and even with a few clouds.